It was a cool summer day, too cold to go to the pool, so my younger son and I decided to bite the bullet and clean out his room. And by “clean out his room,” I don’t mean we revved up the Dyson, sprayed some Pledge, and called it a day. I mean we sorted through every drawer and unloaded every shelf and examined every piece of everything that had been shoved into the closet throughout the past year. It seemed like such a great idea in the moment. After all, the mess wasn’t really that bad. But it didn’t take us long to realize that the little bit of mess that you could see was the result of a whole lot of mess that you couldn’t see behind closed drawers. Bit by bit, we pulled everything out of everywhere. We sorted. We purged. He tried on. And when we finally had to stop to leave for an appointment, it looked like Old Navy, Dicks Sporting Goods, and Toys R Us had exploded from a confetti cannon. The shrapnel was everywhere. Sometimes, the mess that we can’t see is much bigger than the mess that we can. And, sometimes, things have to get messier before they can get better. The disorder was annoying, but I knew that when we finished organizing, my son would more fully enjoy his space and more easily find the things that bring him joy. But to fix the visible mess, we needed to address the problems that weren’t as visible. We had to face the junk and the clutter. We had to look at it and think about it and physically touch each and every piece of it. We had to make decisions and say farewell to some things while saying hello to the unlimited potential of empty space – instead of falling into the temptation of filling it. And then, in the midst of the damaged posters and the Goodwill donations and the dress shoes that are two sizes too small, I realized something – that I am unpacking the drawers and the shelves and the closets of my own self this summer. I am facing the messes that I’ve shoved to the back where I could not see them. I am looking at them and thinking about them and allowing myself to physically touch them and viscerally feel them. I am pulling all of the questions and all of the pain and all of the lessons and all of the regrets out of the hidden spaces, and I am forcing myself to sit in the middle of those piles and sort them all out. I am trying to elevate the gifts in my life to a special shelf and to purge some of the heartache to make the space for what is new and what is good. And you probably need to do this, too. Because we all have a tendency to push the hard, ugly parts of our lives into the furthest corners of our minds and ignore them, and we all have a tendency to pull the easy, more beautiful things into the light. And then post a picture of them on Facebook. When the piles finally cleared, my son’s room evoked a new and palpable sense of peace. We had trashed some things that no longer mattered, things he did not want to keep nor need to remember. We had discovered buried treasures that my son dearly values, and we had reminisced about their significance and given them the special space in his room that they deserve. And we had found items that he no longer needs stuffed in the back of the closet, things that were stealing his valuable space, things that he will now pass along to benefit someone else. Our lives are so similar, filled with problems and messes that we don’t want to face, stuffed with regrets that haunt our days and hurts that steal the empty spaces in our souls. There are mistakes that need to be pulled out of the darkness and corrected, and insecurities and negative influences that need to be thrown out with the trash. There are important life lessons and happy memories that are being smothered by pain that no longer serves us but that we refuse to let go. And there is wisdom that can be excavated from experiences that we’d rather forget, gems that we can’t share with others unless we allow ourselves to dig them up. Stuffing our hurts into the back of the closet may seem easier, but living in the midst of our messes, learning and growing and facing the things we would rather ignore, creates the healthy spaces that our hearts need to heal and to dream and to change the world in positive ways for the people around us. And if I am openly sorting through my piles, I don’t need to worry about what others will discover behind my closed doors. They will have already stepped over my junk just to reach them, and there will be nothing behind them but empty space – space that is ready to be filled by blessings that are yet unknown. It’s tempting to envy a house that seems pristine, an image that seems cut from a retail ad, or a soul that seems unblemished. It’s easy to assume that an uncluttered room is actually clean. But don’t. 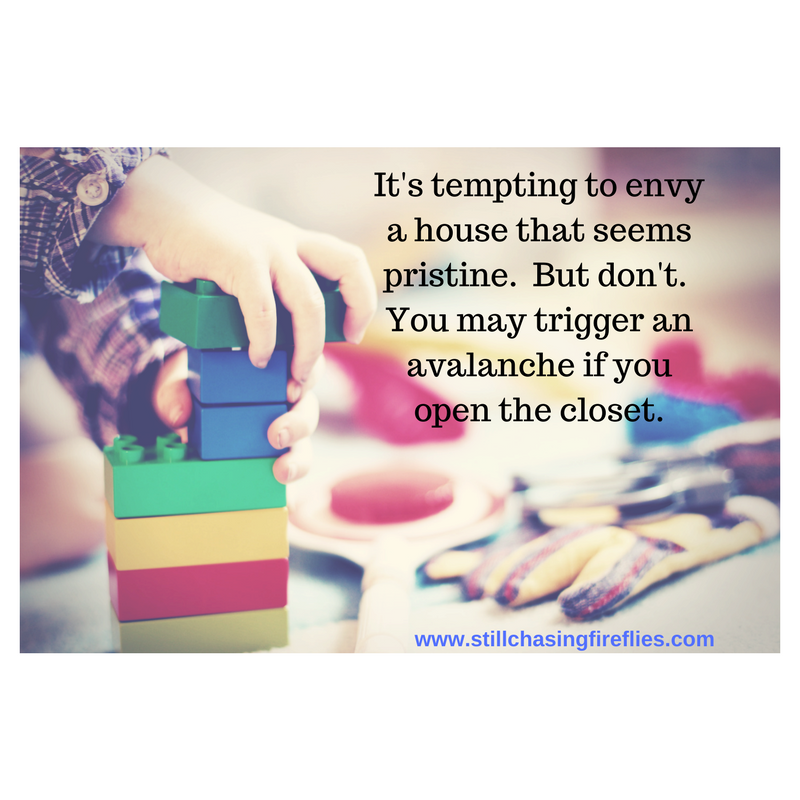 Because you may trigger an avalanche if you open the closet. Just clean your kid’s room and you’ll see. Mary Ann, you have an incredible talent for putting into words something I can so easily visualize. I need to “purge” some rooms in my house too. Love you girl! I can so relate to this post with both the physical and emotional clutter I keep behind closed doors. I get so overwhelmed purging that at times I put some of it back. Nothing like creating a vicious ongoing cycle. 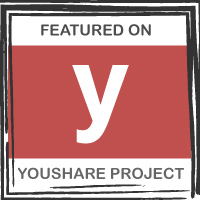 Thanks for sharing…love your posts! I think it’s a universal reality! It’s so much easier just to close the door… or it seems that way, anyway! 🙂 Thanks for your encouragement! So good! I love you! Mary Ann, Thank you for sharing this. Jeff moved back home 2+ years ago but in 1-2 months he will be moving into the house he is remodeling now. It has been a long sometimes painful journey for all of us and I have hopes of a light at the end of the tunnel for us all. Ken and I are looking forward to doing some purging of our own after we get Jeff and his children moved. This experience has been a lesson in many ways about what is really important and what are just things with which we clutter our lives and hide behind. Thanks again. P.S. I am so excited to see what a wonderful insightful person that little blonde sparkplug grew into!! How wonderful to hear from you, Janine! I’m so sorry to hear that Jeff and all of you have faced a painful struggle. As I get older, I realize that every one of us will look up at some time or another and see that we have been given a mountain (that was not on our map!) to climb. The past year has been my tallest mountain so far, for sure, and I’m sure I will share more about that with time. Maybe we need to have a reunion!